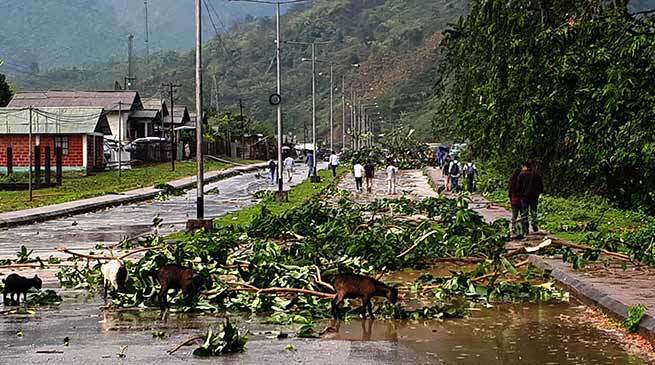 A storm with thundershower on Wednesday at around 12.13 PM created lots of trouble for people in Yupia town of Arunachal Pradesh with uprooting of several trees and roofs of Kucha houses and several inconveniences to the office staffs in district headquarter at Yupia. Several window panes (glass) of the Papum Pare Deputy Commissioner Office were broken, several trees were uprooted and fall on the road in Yupia area and few CGI sheets roofing of the houses at Tikdo and other area were blown away. The rain water was seen enter in the office and the office staffs have to face lots of inconvenient thereof and the staffs were seen moping the water from the office premises. A officer from DC Yupia however said that there is no loss of life have been reported from any part of the district, the uprooted trees will be clears soon and traffic was made normal and was not affected so far.